We are EXCITED to bring back our Youth Summer Camps for the months of June and July! 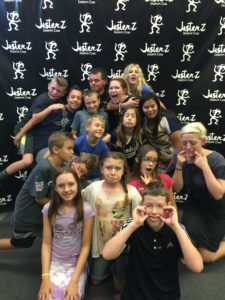 Summer Camp is a wonderful opportunity for your child to grow as an individual, work together as a team, and gain valuable life skills – all while having the time of their life! Below you will find the curriculum, teacher bios, daily activities, as well as information about what your child should bring with them when they arrive! ADVANCED Summer Camp (July 24-28) age group 12-17 FOR KIDS THAT WANT TO LEVEL UP!! 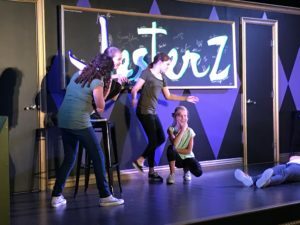 Everyday the kids will learn new improv lessons that apply to both the stage and life. Lessons like staying positive, listening, eye contact, communication skills, and empathy. Everything that they learn is instrumental in their personal growth. Below you will find some of our core lessons. Listening – It’s a world-wide epidemic that kids don’t listen. And there’s not a lot of summer camps that focus on the SKILL of listening. Improv is about creating together and REQUIRES that we listen to each other. It’s the #1 rule in improv! Team Work – We reinforce the individual contributing to the success of the whole. Each kid and their imagination work with 1-10 other people to create amazing scenes on the spot. Requires listening skills! Pantomime – It’s the movement or display of action on stage. We teach the kids how to expand their creativity and really use their imagination. We get them to start flexing that creative muscle. Not only does it get them up and moving, it also showcases their ability to display their creativity in a unique way. Characters – Playing characters and making bold choices can be really fun! It also teaches us empathy. To play someone else besides ourselves teaches us to think in a different perspective, teaches us to have perception. 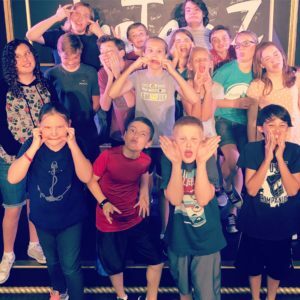 ADVANCED IMPROV SUMMER CAMP IS FOR KIDS AGES 12-17 WITH A STRONG DESIRE TO TAKE IMPROV TO THE NEXT LEVEL!! Each morning begins with connecting with the team through FUN and interactive warm up games. Wake up the brain with quick thinking exercises and activities & wake up the body through movement. With a focus on give and take, we’ll learn to respect each other and ideas. After we are warmed up, we will get on stage and practice improv skills through scene-work. 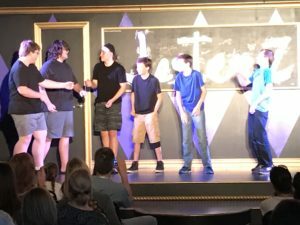 Learn improv and acting techniques that are universal. After Lunch, we’ll break out into smaller groups and focus on learning improv games for performance. 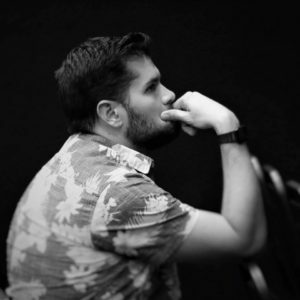 David has spent the last year as JesterZ Education Director and has been doing improv since high school. 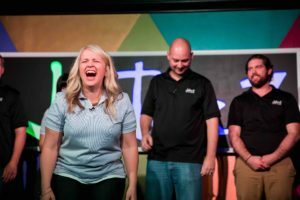 He has the ability to relate improv to most any circumstance we face in life – personally and professionally. The kids love his easy-going and fun-loving teaching style. Monday-Friday 10:00 a.m. – 4:00 p.m.
We are so excited for your interest in summer camp for your youth! There will be emails sent out with additional information as Summer Camp approaches. Hi, I’m interested in signing up my 2 boys, 10 and 8, for the week of June 19. Could you send me info on the processes & protocols you use to ensure safety?